Everything is vibration; the sounds you hear, words you speak, and emotions you feel. Some vibrations lift our spirits while others ground and move us deeply. With healing instruments, aromatherapy and techniques from around the world, experience listening with your entire body to access deep relaxation, meditation and emotional release. Mantras, indigenous chants, and other sonic textures are a powerful means of cultivating inner peace and quieting the mind. The art and science of sound healing is designed to harmonize the body, mind and spirit. Intimate sound meditation sessions for individuals, couples, or families using instruments, songs, and aromatherapy techniques from around the world. This type of session is powerful for navigating transitions in your personal and/or professional life. It is also good for grounding, setting intentions, and gaining clarity moving into important life events. Sessions with children are possible pending a consultation. A sound bath is a guided meditation for deep relaxation and emotional processing in a group setting. Sound baths are facilitated by trained healers using instruments, songs, and aromatherapy techniques from around the world. This is a good option if you host group events at a public or private venue that have a healing/meditative intention. 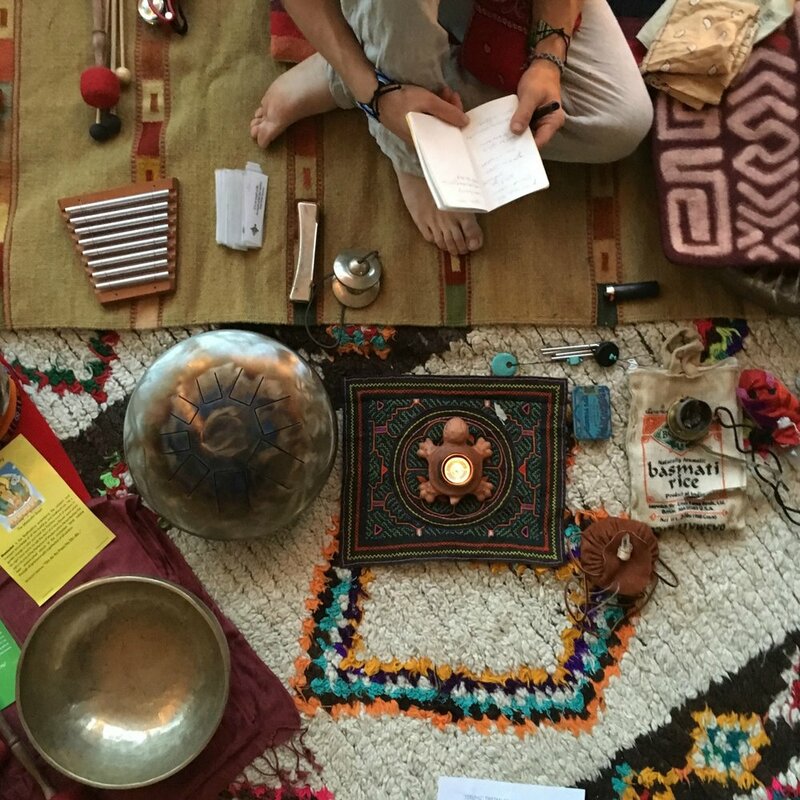 If you want to be trained to facilitate sound healing experiences for groups or individuals, customized curriculums are available. Learn mantra meditation. Teachings, group recitation, and guided meditation drawing from Tibetan, Native American, Indian and other traditions. This is a good option if you would like to learn or offer a workshop to your group/community on the subject of traditional and contemporary techniques and uses of mantra for meditation. Enhance your yoga class/practice with live instruments, ambient sound, and rich musical textures to deepen you or your students' experience. Instruments from around the world. Public sound bath, Long Island City, 2017 solar eclipse. Tools/equipment used for sound healing.